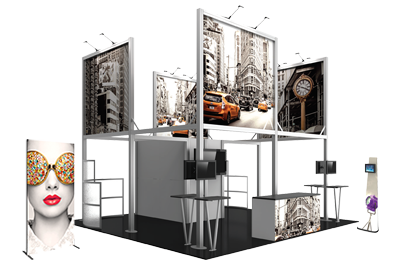 Linear™ Pro Modular Backwall Kit 25 is a portable 10' x 10' display solution that incorporates Hook and loop graphics with UV printed graphic headers and wing accents. 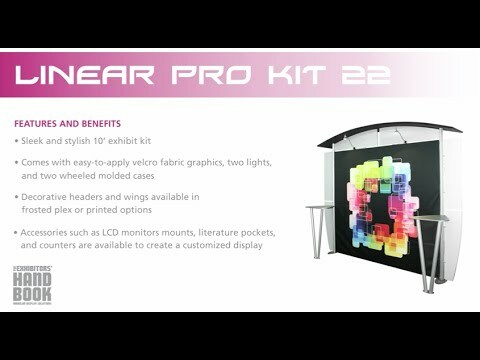 Pillowcase graphics easily set up to create a fabric canopy, and dual tables create a welcoming environment for your audience while providing additional messaging and branding opportunities. Lighting is included to highlight custom graphics and messaging.